In modern society, the idea of ‘me first,’ especially among younger generations, is quite prevalent as people seem preoccupied with doing things only for themselves. But what if we pause and think about what we can do for the collective good. Do you know what is your parents' dream? Most immigrants sacrifice everything including their dreams to give a better life for their children; the latter do hope to pay back their parents. This dynamic reflects the undeniable mutual desires between the two generations in many immigrant families. Together, Shall We…, a multi-media production, provides a platform for the two generations to set aside their self-centeredness in a highly egoistic era, to have a heart-to-heart dialogue about each other’s dilemmas and struggles, and to walk hand-in-hand in discovering and realizing each other’s aspirations. Adapted from true stories, Together, Shall We… strives to create a cross-generational legacy of hopes and dreams. Through this special project, over 100 youth volunteers are given the opportunity to participate in stage productions and behind-the-scene operations such as script-writing, planning, logistic management, budgeting and marketing – all of which help foster their team spirit and creativity. 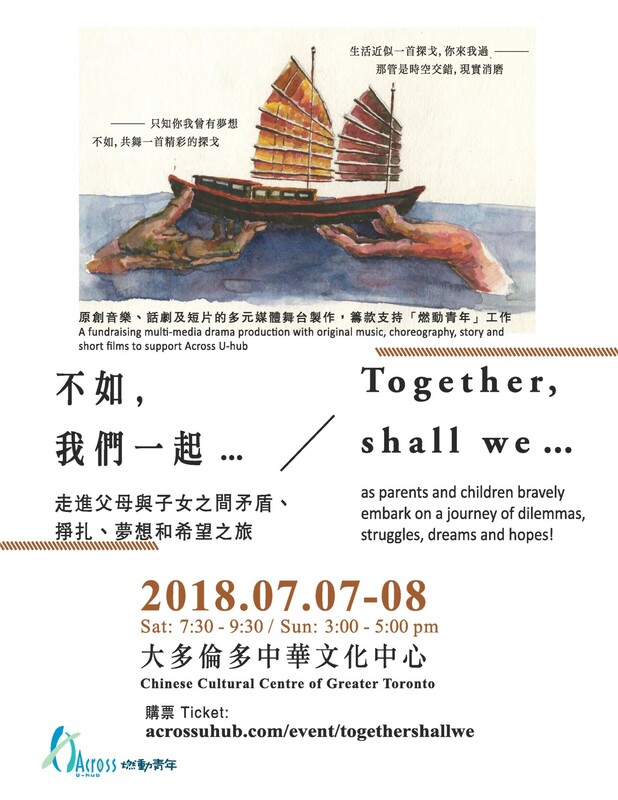 Together, Shall We… is a youth-led creative work using multi-media expressions (including drama, music, interviews and short films) and under the guidance of professionals and experts in respective fields.